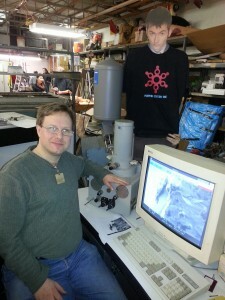 Back in January, we got word that Philip Strong, a past member of PS:One, worked for a company that needed to get rid of a working scanning electron microscope and was considering donating it to PS:One. While we have an existing SEM in the space (a Leica S440, owned by JP, a member), this one supposedly was fully functional, had documentation, and we could get some help from the microscopist, Susan Young, who used it. Of course we were interested! On Monday the 18th, I learn that yes, the donation was approved, but with a catch: It had to be moved on Saturday the 23rd! So in just five days, the space really came together to make this project a reality. JP gave me excellent advice on moving it, and a recommendation on where to rent a truck with a lift gate. Eric Stein proposed a vote to reimburse me for moving expenses. On Friday, I traveled to Ingredion‘s Argo corn refining plant to take stock of what was there and begin disassembly for moving. The scope itself is a Leica Stereoscan 430, an older and smaller cousin of the Leica S440 already at the space. It was outfitted with secondary electron and 4 quadrant backscatter electron detectors, as well as a liquid nitrogen cooled Oxford Isis EDX system, which I was told was non-functional; they had replaced the HV power supply with a new one but it still didn’t work. The system includes a High Resolution Recording Unit (HRRU), essentially a cabinet that can accept a Polaroid camera. (Anyone know if you can still get 545 film?) And they included a thermal video printer, as well as a Technics Hummer V sputter coater which is necessary for imaging non-conductive samples. They had the machine pumping down the chamber and column all day after having not been used for 3 months, and while it was only at 6.5E-5 torr when I arrived, that was good enough to turn on the beam. And… wow. It worked. I could just keep zooming and zooming and zooming. I could see 300 nm spheres of adhesive tape droplets, viewed at 120,000 times magnification! Next came the task of disassembly. We had to remove the EDX sensor from the chamber carefully. (Fortunately they saved the shipping cover for the sensor, and had the port cover for the vacuum chamber.) In order to get this on a lift gate, we would need to separate the desk with the computer (a 486 running custom software under Windows 3.11), most of the power supplies, and the DAQ board from the “plinth” holding the optics column, turbomolecular pump, high voltage power supply, and boards controlling the electron optics and vacuum system. This required tracing a ratsnest of cables, photographing, labeling, documenting, and removing them. Phil provided amazing help here. This took until 12:30 AM, and we decided to regroup the next morning. I picked up the rental truck Saturday morning, a 16 foot diesel box truck with a lift gate. Driving it was… highly disconcerting. PS:One member Elizabeth Koprucki (my partner) accompanied me and provided much needed “can I get over a lane?” “get out and help me back up” etc. collision avoidance advice. Phil and I still had several hours of work tracing the remaining cables until we had everything moved and could separate the plinth from the desk. Then came loading, and lashing the heavy stuff to the side of the truck. (Watching a delicate SEM originally valued at 6 figures ride a lift gate isn’t for the faint of heart.) By the time we left the plant, with Elizabeth balancing the delicate EDX detector on her lap in the truck, it was 5 PM. Upon arriving at PS:On e Saturday evening, an entire crew of people volunteered on the spot to help shift stuff around to make room for it, and helped move all the equipment into place. JP had arranged with a friend to make sure a small pallet jack was present, which made the move so much easier. After returning the truck, I came back and pulled a late night beginning the process of reassembly, which I continued Sunday afternoon and Monday evening. Thanks to everyone who helped reposition things, trace and pull cables, and figure out obscure wire connectors. An aside: during this time, I started going through all the boxes of stuff that came with the scope. I had no idea that while Phil and I were handling cables, Susan was packing and labeling everything meticulously. I’m not kidding. I found all kinds of original parts, tools, sample prep material, spare bell jar for the sputter coater, all with helpful notes, plus manuals, training course material, install and license disks, operation and maintenance logs, spare electron gun parts including the high res low voltage anode…. I cannot believe how excellently they kept and organized stuff at Ingredion’s lab. By late Monday night it was ready to power on. Thanks especially to Steve Finkelman for pulling what became an all nighter with me Monday, and solving the first hitch: a disk controller error. 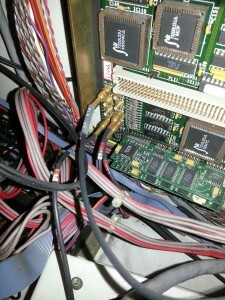 (Steve saw the IDE cable was plugged in upside down.) While debugging this, I used switches on the vacuum control board to force the backing pump and turbo pump to turn on, and at least start getting the system pumped down. Next task: Starting the LEO software under Windows to control the SEM. Unfortunately, it couldn’t communicate with the stage and vacuum control board. 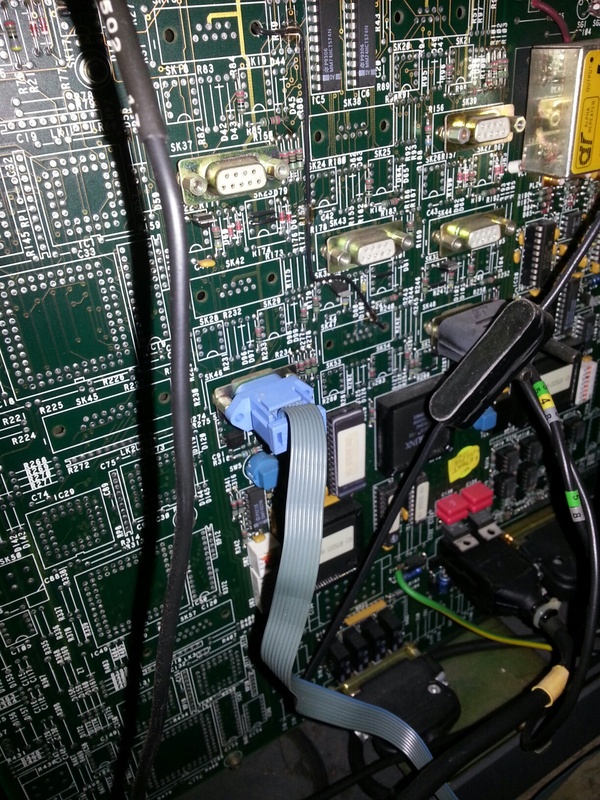 After a lot of head scratching, I realized the board had two fiber optic connectors, not one, and I’d plugged the fiber from the DAQ board into the wrong one. Then, success! I could control the pumps with the software and get a reading of the vacuum. When it finally got down to 1E-4 torr, we switched on the beam. And it worked! We had images! At this point, an all nighter was inevitable. But in a little over 48 hours of the scope arriving, we were imaging the samples already in the chamber! So I came back Tuesday night. The membership meeting happened, but it slipped my mind, as I was busy in SEM land. Thanks to Brian Sheppard for the attempt (unfortunately unsuccessful) to image the SEM’s hard drive so we have a backup in case of disaster. We got the thermal printer working. Steve had melted some bismuth crystals, and we prepped a stub, loaded it, and pumped it down, producing some seriously awesome images. Scope and secondary electron images work very well. Vacuum only went down to 8E-5 torr as of Tuesday night. We should be operating in the E-6 range. This may need troubleshooting. 4 quadrant backscatter detector doesn’t seem to work. (It also didn’t when I tried it at Ingredion.) 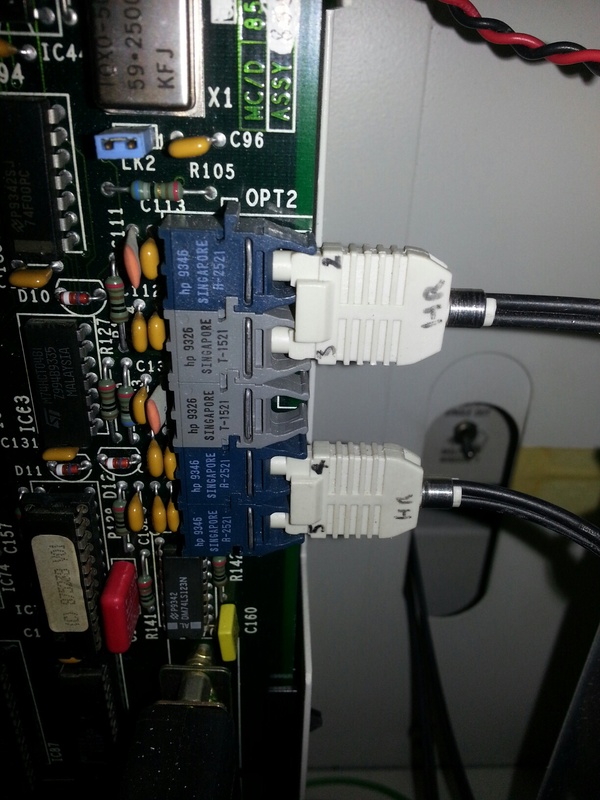 The scope config has it listed as being on a different input on the DAQ board than it is, but that didn’t fix it. We need to get the hard drive imaged and make backups of the install disks. Sputter coater holds vacuum, but needs a good cleaning, a replaced power cord, and a higher purity argon bottle. Necessary before we can image non-conductive samples. A lot of the covers are off the unit for work/debugging. This needs to be fixed. 486 CPU fan is dead. We need one before we can close up the side panel. A 16 bit Ethernet card with appropriate drivers and software for Win 3.11 is needed. The scope generates 1024 x 768 TIFF files, but other than 3.5″ floppy which is not efficient, there’s no way to get image files off the machine. Thermal printer needs some attention. The cutter may not work well, and the print settings don’t look optimal when compared to the printouts I’d seen in the archive of stuff. We need to build a shed around the scope, maintained at positive pressure with a HEPA filter so we can isolate the scope from the dust generated in the shop. Theory of SEM operation, how to use the software to image samples already loaded in the chamber, etc. Sample prep, opening the chamber, changing out samples. It makes no sense to run this until we get the sputter coater working. I’ll need to investigate class supplies people will need to buy. I’d really like to add a fourth certification on EDX should we get it working and find a liquid nitrogen source. All in all, I’m excited. I only know of one other hackerspace in the US with a SEM. So much thanks are due to everyone who made this possible! tl;dr – Working SEM is working. At our space even. Yay! What sort of connection goes from the 486 to the device? The 486 is actually a single card PC that sits in an ISA card cage. 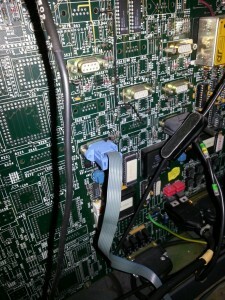 The scope’s main DAQ board also sits on the ISA bus. There are spare slots; fortunately the scope manufacturer lists IRQ, DMA, I/O ports etc. used so one can work around a conflict. The other problem is that I’ve almost completely forgotten how to do networking on DOS/Windows…. Ideally I’d like people to be able to FTP images to a drop box. Although the Impossible Project makes several Polaroid films, 545 is not among them. Have Liquid N2 @ our shop NFC Co 2944 N. Leavitt St 60618 also have 20 liter Dewar for transport. The isis box will work for digital image capture even if the EDS detector is non-functional. Isis typically controlled column and scan control digitally in order to allow for eds mapping. If you can bring the sytem back to life, you will have a working digitial imaging system that is potentially superior to that of the SEM. In my previous experience with this family of microscopes, we were able to map the 3.1 system via ethernet to a network server and file sharing. I think I should take a look at that. There’s some problem, though, with the Isis. 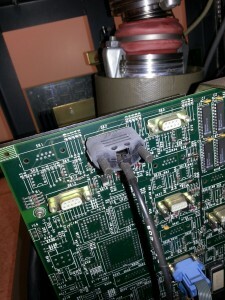 I’ve heard from the donor that they replaced the HV power supply to no avail, and it is either electronics or software. I’d be interested in seeing what the Isis could do…. 1. I want to image the hard drive so we have a backup in case anything goes wrong with drivers, etc. 2. It has been many, many years since I did networking under Windows so there is going to be a relearning curve. What a cool piece of gear. I hope I can get some time to swing by and see this thing in action.